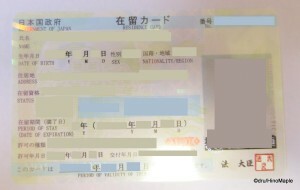 Japan had instituted a new residence card in July 2012 and a little over a year later, I got my new residence card. The card was a way to streamline the process so that they could track you easily. Foreigners were treated as a separate category according to each city. Now, each resident, foreign born or domestic, is given a special residency number as well as the new residence card. In the old system, your visa was placed in your passport and you had to register with your local city where they would issue you a special Certificate of Alien Registration. The cards were issued by each city and came in two main flavours. In the past, when you moved, you had to register the change with your old local city hall, and your new local city hall. You then had to get your Alien Card amended at your new city hall. The information was pretty basic and it included a lot of personal information, such as your passport number. It even included a lot of information that wasn’t necessary, such as my employer’s address, my hometown, place of birth, and the head of the household. The new cards have less information and have a distinct yellow/green hue compared to my old white card. It looks a bit better, but the colours could be better. This time, the information on the card has been reduced. It only provides my basic information, my address, and my visa information. It no longer has my hometown, but it does have my nationality. For privacy sake, it is a lot better but the need to update the card can be a little more of a hassle. I have to send a letter in to the immigration bureau of any changes, but thankfully I don’t have to worry about that for a while. Below you can see copies of both cards, without my personal information, of course. This entry was posted in Daily Life in Japan, Japan and tagged Alien Card, Alien Registration, japan, Residence Card, Visa by Dru. Bookmark the permalink. How’s the bureaucracy in getting it updated? I’m not sure about updating it. 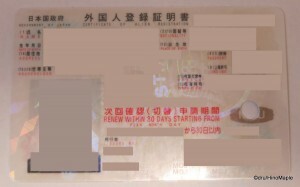 Renewing it comes at the same time as your own visa renewal. If you lose it, probably a pain. It was never really a bureaucratic problem as long as you filled out the right form and had a new picture. Changing your address is pretty easy though. Just tell them by mail. Before, I had to visit the city hall to update my address. I still have to do that though but that is more for residency purposes than immigration purposes.